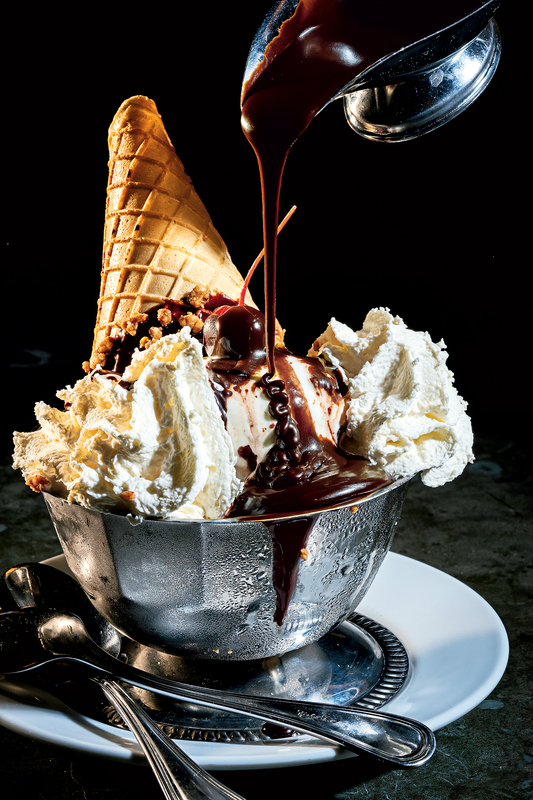 From Peking duck to hot fudge sundaes, these dishes will make it all better. 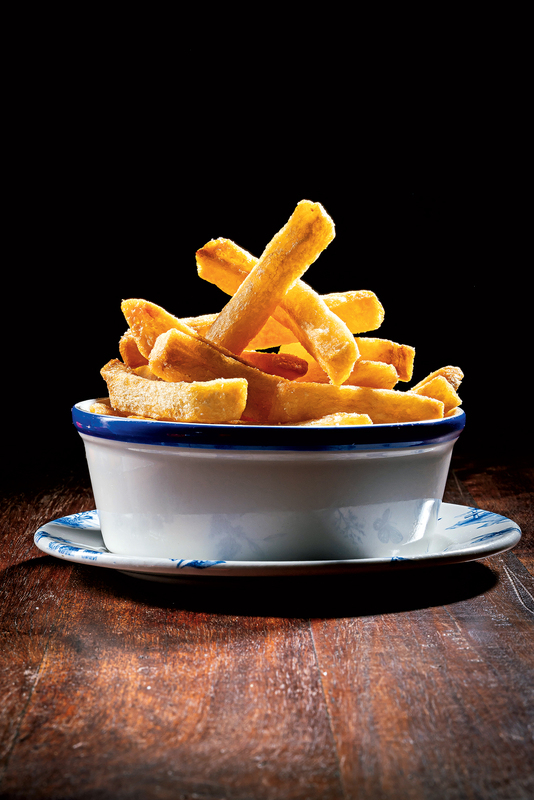 The extra-thick French fries at Primrose. Comfort food. What does it mean to you? Probably something different than it means to us. No other category of food is shaped so much by personal memories and nostalgia. The genre has always seemed more timeless than trendy. And while certain staples such as chicken soup or grilled cheese have endured, comfort food is shaped by what’s going on around us. Take the convenience dishes of the ’80s (remember Wolfgang Puck pizzas? ), which helped two-income families speed up dinner and afterschool snacks. Or the inexpensive cuts of pork belly and short rib that dominated after 9/11 left restaurants reeling. Or the grain bowls and avocado smoothies that have spelled out self-care lately. Nowadays, when food is both global and hyper-accessible—it’s possible to have Peking duck or truffled pasta delivered to your door—comforts are so much more eclectic. Herewith, our 35 favorite ways to indulge. Sorry, McDonald’s, but we prefer our fries supersized. The thick-cut frites at this Brookland wine bar are brined in saltwater and triple-fried in peanut oil until they’re the perfect golden hue. 3000 12th St., NE. Rutabaga fondue? We were skeptical until we dipped hunks of pretzel bread into this velvety concoction. Plant-based pioneers Kate Jacoby and Rich Landau first began transforming the roasted vegetable into fromage-like dip at their Philadelphia flagship, Vedge. “Add some white wine and caramelized shallots and the fondue was born,” says Jacoby. The dish hasn’t come off their menus since. 600 H St., NE. 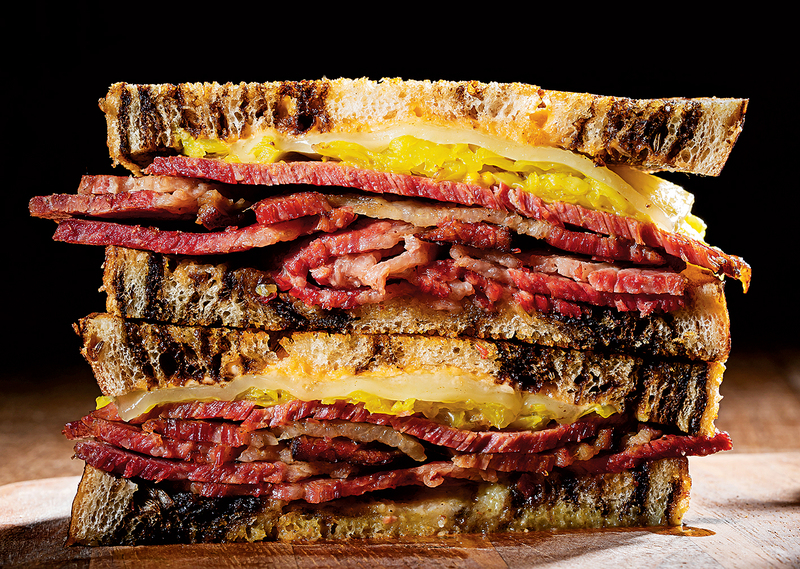 This sandwich might sound simple—pastrami, kraut, Swiss, rye—but the whole thing takes more than a week to make. Recently installed chef Adam Howard brines Roseda Farm brisket for eight days before smoking, steaming, and grilling it, and marinates his turmeric-tinted cabbage for 41 days. Even the Worcestershire sauce and bread-and-butter pickles in the Thousand Island dressing are house-made. 1201 24th St., NW. Reuben at Blue Duck Tavern. Momofuku creator David Chang is just one of this sandwich’s many fans. 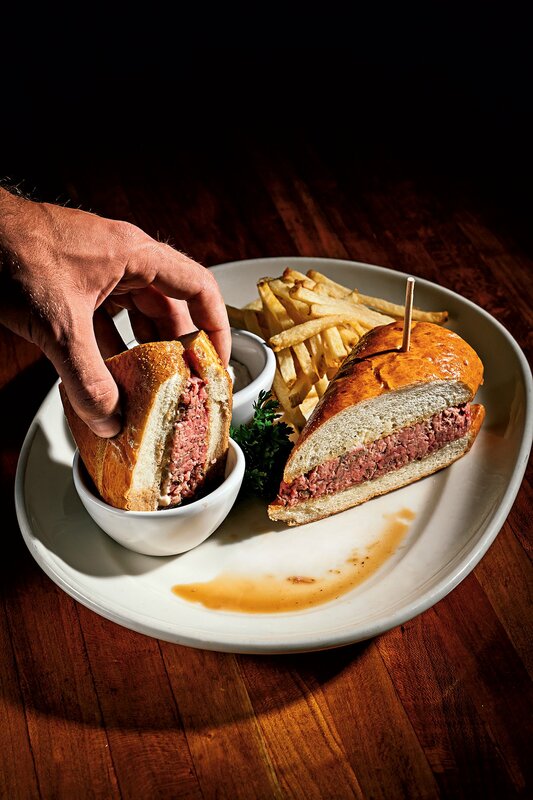 The pile of very thin prime rib is supremely juicy and served on the perfect soft roll—so good on its own, you barely need the dipping jus. But you do need to say yes to the horseradish when your server asks. 7715 Woodmont Ave., Bethesda. This sundae combines two classic pairings: The vanilla ice cream is buried between both extra-thick fudge and chocolate cake. A shard of almond bark or a waffle cone gives it a little crunch, but beyond that, the confection is by the book—and all the more delicious for it. 901 F St., NW; 1314 U St., NW. Soup is a solitary exercise—and a welcome one if you have share-plate fatigue. 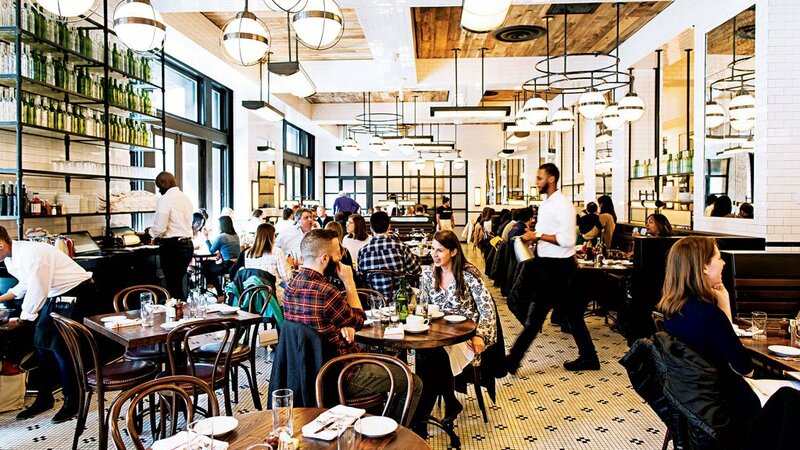 There’s nothing better than perching at this Union Market oyster bar and tucking into a bowl of lush stew packed with Barcat oysters and bacon. Don’t forget a few dashes of the house hot sauce—or a good book. 1309 Fifth St., NE. Hot-fudge sundae at the Smith. These giant wings, roasted until fall-apart tender and smothered in a rosemary-flecked gravy, call to mind Thanksgiving. But instead of dry breast, you get the best dark meat that hugs the bone. Platters come with cornbread stuffing plus two sides—we’re fans of the pork-studded collards and cheddar mac. 1704 U St., NW; 5431 Indian Head Hwy., Oxon Hill. Restaurants, keep your trendy roast chicken—we’re feasting on duck at this 40-year-old institution, which has lured a spectrum of celebrity guests (the Bushes, Psy). The details make this bird stand out: house-made hoisin and fresh pancakes, scallions grown on the Tsui family farm in Purcellville, and servers who expertly hew the moist meat and crackling skin. 6029 Leesburg Pike, Falls Church. Chef Vikram Sunderam took inspiration from croque monsieur for this decadent naan. Instead of French ham and Gruyère, the pillowy bread is studded with bacon—a common Goan ingredient—and laced with sharp English cheddar and chili flakes. The result: globally delicious. 3309 Connecticut Ave., NW; 2000 Pennsylvania Ave., NW. The French dip at Woodmont Grill comes sided with both jus and horseradish sauce. We’ve seen this sandwich-and-soup combo dressed up with truffles, chilies, and plenty of other ingredients, but we crave it most in its simplest form. That’s what this Dupont Circle locavore market/cafe does best: an ultra-crispy, super-gooey blend of Swiss and cheddar on sourdough. Grab a cup of tangy tomato-basil soup for dunking. 2001 S St., NW. Few restaurants are as much of a cure-all as this homey Korean dining room, which specializes in bubbling soups and restorative stews. Need a boost of energy? Try this milky beef-marrow broth with noodles and tender meat, which you doctor up with spices, scallions, and, for a kick, a few splashes of kimchee juice. (Our tip: If you’re dragging from a hangover, haejang guk, a zesty beef-rib soup, also does the trick). 7133 Columbia Pike, Annandale. It’s the details that make this bowl of Vietnamese soup stand out. Meaty, fatty chunks of oxtail are a nice alternative to the typical selection of brisket, tripe, and meatballs—and the house-made chili and lemongrass sauces put the dish over the top. We could eat the latter condiment on just about everything. 8130 Sudley Rd., Manassas. “A chef always told me, ‘Just when you think your onions are done, cook them a little more,’ ” chef Gregory Lloyd says. Deeply caramelized onions are just one of the secrets to this French bistro’s cheese-laden crock. An intensely flavorful (and heavily reduced) veal stock is stoked with sherry and Chablis, then topped with a mix of provolone and Gruyère, plus a dusting of Parmesan, which imparts the ideal crustiness as the cheese is melting. 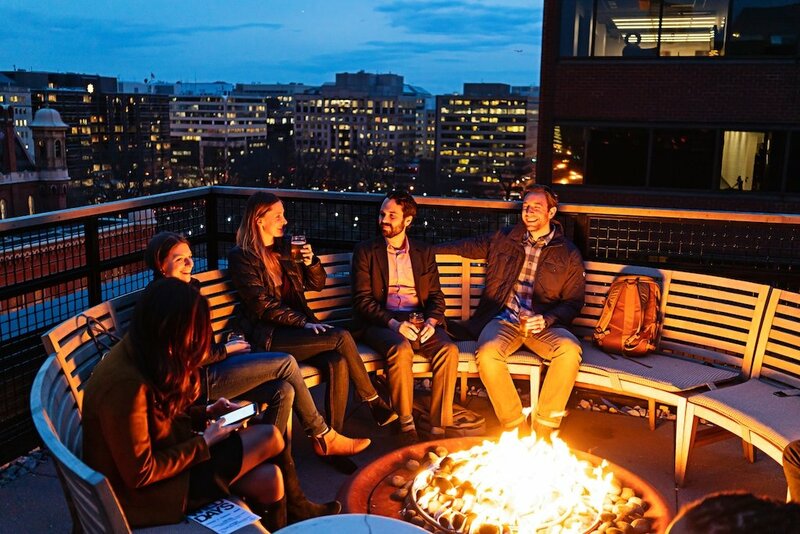 1601 14th St., NW. 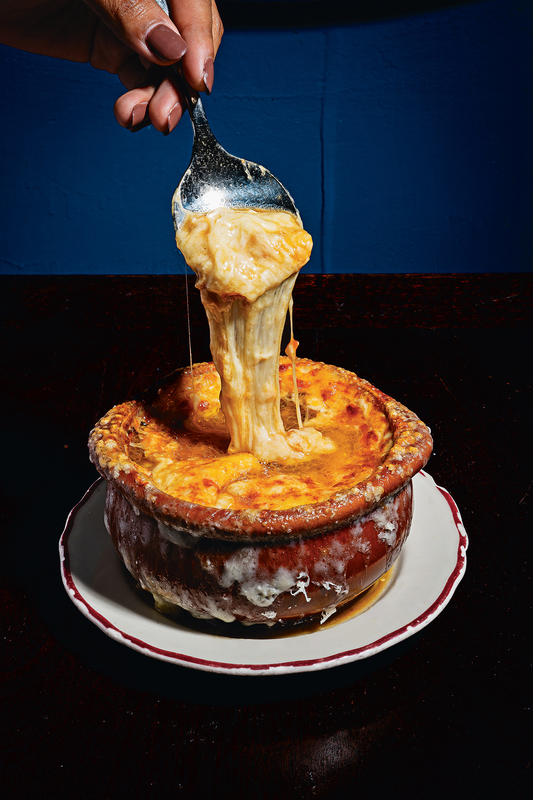 Le Diplomate’s onion soup is capped with three cheeses. This Park View joint serves your typical lineup of pancakes and omelets, but neighbors in the know go for the Ethiopian breakfast. The two options include scrambled eggs, onions, and peppers mixed with niter kibbeh (spiced clarified butter) and a mild berbere seasoning. 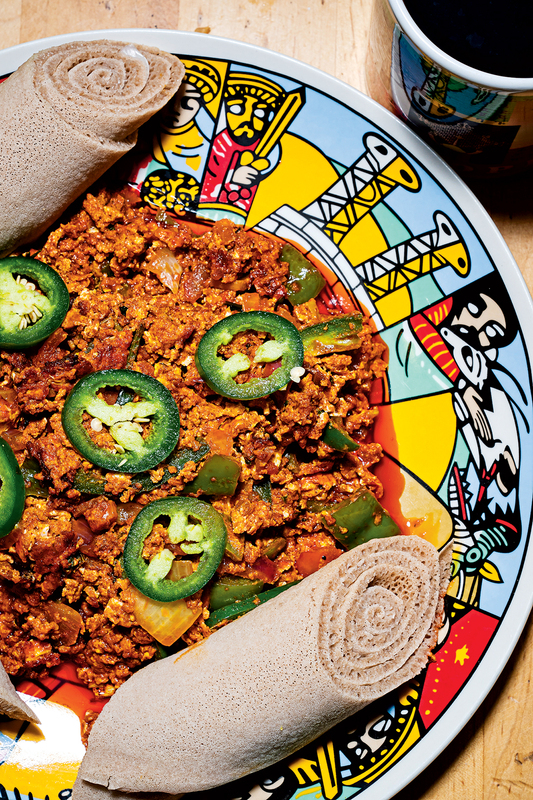 One dish comes with a side of rolled injera, while the other resembles Ethiopian chilaquiles with a pita-like bread called kita. 3213 Georgia Ave., NW. Korean barbecue usually comes with ssamjang (red-pepper paste) and sesame oil with salt for dipping. 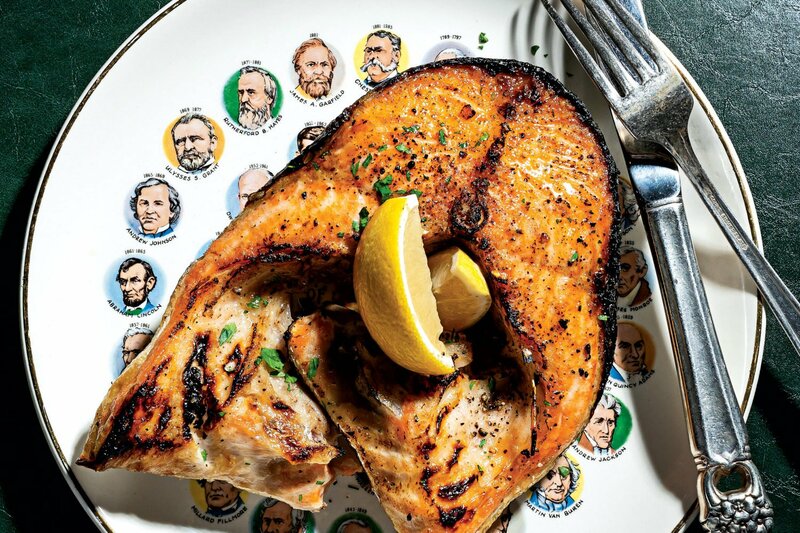 But at this boisterous destination for tabletop grilling, combos include a complimentary cast-iron skillet filled with stretchy cheese and corn, which oozes, then crisps over the flame. If you’ve never scooped thick-cut pork belly through kernel-studded mozzarella, you’re missing out. 9619 Fairfax Blvd., Fairfax. 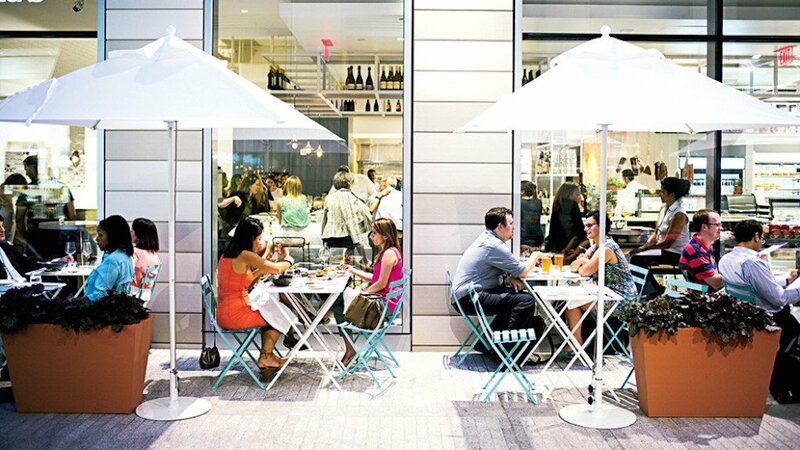 Many mornings, you’ll have to compete with stroller-pushing parents at this Del Ray spot. The beautifully flaky, golden biscuits are worth the hassle. Owner Nicole Jones tested several recipes before settling on the classic trinity of ingredients: White Lily flour, butter, and buttermilk. We love them with a slather of the house-made jam, but they also make for a pretty tasty fried-chicken or bacon-egg-and-cheese sandwich. 2309 Mount Vernon Ave., Alexandria. Ethiopian-style scrambled eggs with jalapeños and rolls of injera at Heat Da Spot. Ramen gets all the glory when it comes to Japanese comfort food, but don’t underestimate the rice bowl. One of our favorite versions of donburi arrives topped with buttery slabs of eel charred under a blowtorch with egg, caramelized onions, and a sweet soy sauce. Grab a kitchen-counter stool to watch your meal being made. 2438 18th St., NW; 1134 19th St., NW. Traditionalists may want to look elsewhere, but we’re hooked on chef Tae Strain’s version of the Southern spread. The creamy mix of sharp, smoked, and white cheddars is studded with fermented chilies, then finished with pickled kohlrabi and jalapeños. Subbing for saltines: warm, stretchy Chinese-style bing bread. 1090 I St., NW. If, like us, you think the best part about eating a pile of Buffalo wings comes at the end, when the creamy blue-cheese dressing and hot sauce have combined in equal measure, get yourself to this downtown Bethesda sports bar. The warm, tangy family recipe from the upstate New York–bred co-owner features plenty of Frank’s hot sauce, shredded chicken, and sharp blue cheese, but also a wild card: Sriracha. On the side: a big mess of tortilla chips. 4866 Cordell Ave., Bethesda. 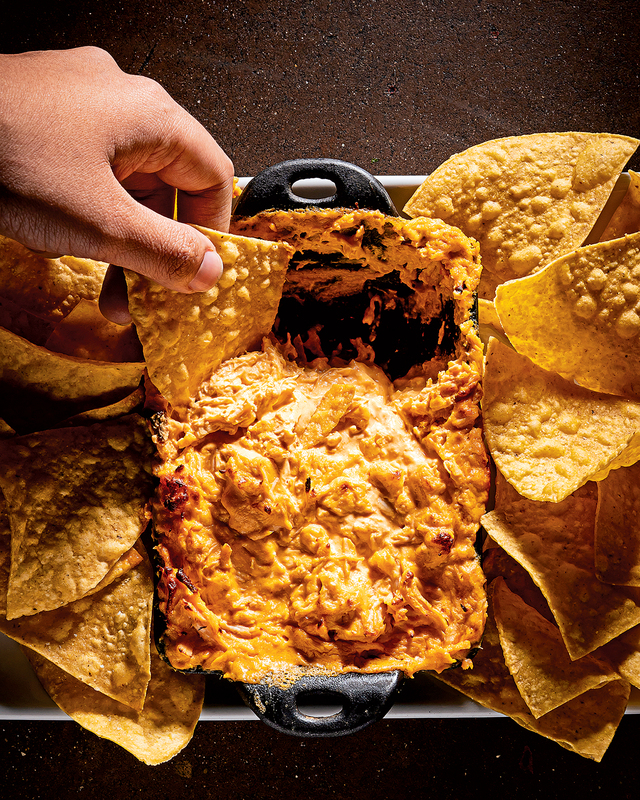 Buffalo-chicken dip at Brickside Food & Drink. The sticky, sugary breakfast indulgence is having a moment right now, showing up at many a bakery and coffee shop. Our favorite version is at the Black Restaurant Group’s Southern-inspired Logan Circle kitchen, which offers a couple of twists: Instead of the classic brown-sugar-and-cinnamon glaze, the pull-apart yeast rolls are sheened with orange butter. And instead of calling the cast-iron-baked sweet by its traditional name, it’s known here as mopsy bread. 1612 14th St., NW. Chocolate-chip cookies are a divisive topic—some like them crispy, others soft. If you fall into the latter camp, these sister pizzerias are your place: An oversize cookie is pulled straight from the oven, with—depending on the location—vanilla gelato or a dollop of whipped mascarpone melting into the still-hot rivulets of chocolate. 1250 Ninth St., NW; 79 Potomac Ave., SE.